The 2015 Chevrolet Silverado 2500HD and the Ford F-250 are two of the most popular heavy-duty pickup trucks on the road. Both models were built to haul and tow impressive loads. Inside, passengers can kick back in high-quality cabins and enjoy available high-tech convenience features. If you're having trouble deciding which model is best for you, check out our four-category guide. Those who shop the heavy duty truck segment require a steady supply of power. The 2015 Chevrolet Silverado 2500HD delivers enough output to tow a maximum load of 17,900 pounds - besting the F-250 by more than 1,000 pounds. All models come standard with rear-wheel drive, but shoppers can add four-wheel drive to any Silverado 2500HD. The 2500's standard engine is a 6.0-liter V8 engine. Equipped with the six-speed automatic transmission, it makes 360 horsepower and 380 pound-feet of torque. Drivers can choose to equip this engine to run on either gas or compressed natural gas (CNG). With this bi-fuel option, the 6.0-liter V8 makes 301 horses and 333 pound-feet of torque. 2500 shoppers can also select a turbocharged 6.6-liter diesel V8 that generates 397 horses and 765 pound-feet of torque. It's paired with a more substantial six-speed automatic transmission. Properly equipped with a fifth-wheel hitch (and depending on configuration), the 2500 tows a maximum load of 17,900 pounds. It hauls a maximum payload of 3,760 pounds. The Ford F-250 comes standard with a 6.2-liter V8 engine that makes 385 horses and 405 pound-feet of torque. Shoppers can also choose a 6.7-liter turbocharged diesel-powered V8, which produces 440 horses and 860 pound-feet of torque. Both engines are mated to a six-speed automatic transmission. As with the 2500, drivers can choose between rear- and four-wheel drive. Properly equipped and configured for fifth-wheel towing, the F-250 can tow its maximum load of 16,800 pounds. It hauls up to 4,130 pounds. Both models offer configurations designed to appeal to a wide range of drivers, but the 2015 Chevrolet Silverado 2500HD takes the lead with its straightforward offerings and impressive interior space. Shoppers can choose between three cabin styles: regular, double, and crew cab. The regular cabin is paired with a long, 8-foot bed. The double and crew cabs offer a choice between the standard 6.5-foot and long 8-foot beds. Finally, shoppers can select one of three trim models - the Work Truck, LT, and LTZ - each of which is more luxurious than the last. The F-250 is offered with the same three cabin styles. Its regular cabin is also paired with the model's long bed. The extended cab and crew cab models offer a choice between the standard 6.8-foot and long 8-foot beds. F-250 shoppers can choose between five trim models, the XL, XLT, Lariat, King Ranch, and Platinum. It might be designed for heavy-duty work, but the 2015 Chevrolet Silverado 2500HD offers modern convenience features that rival luxurious family sedans. The entry-level 2500HD Work Truck model comes with everything drivers need to get to work in comfort and style, including a 4.2-inch color display. The mid-range LT is even more luxurious. Its OnStar technology comes with a 4G LTE Wi-Fi connection so passengers can stay connected on the go. Voice controls let drivers alter entertainment settings without looking away from the road. The upscale LTZ is stocked with high-tech features. Its upgraded MyLink interface lets users interact with a wider range of infotainment apps via an 8-inch touchscreen. When it comes to features, the F-250 isn't far behind. The entry-level XL fulfills basic needs. The XLT comes with a wide range of modern conveniences. Its keyless entry technology means drivers save time in the parking lot. Sync voice controls let drivers browse infotainment options safely. The upscale Lariat is a great choice for tech-savvy drivers. Its MyFord Touch interface gives users access to a wide range of infotainment apps. The King Ranch and Platinum models are similar to the Lariat, but each offers its own unique design elements. The 2015 Chevrolet Silverado 2500HD is our pick once again. Its impressive array of standard safety equipment helps drivers maintain control over difficult road conditions. The available OnStar telematics helps drivers solve a variety of problems with features like remote door unlocking and stolen vehicle assistance. Shoppers can add the Driver Alert package, which includes a wide range of high-tech items designed to enhance driver vigilance, such as lane-departure assist and forward-collision alert. When it comes to safety, the Ford F-250 offers stiff competition. As with the Silverado 2500HD, standard equipment like antilock disc brakes and traction and stability control help drivers avoid unnecessary accidents. On higher trim models, shoppers can add high-tech equipment designed to help drivers remain as alert as possible. 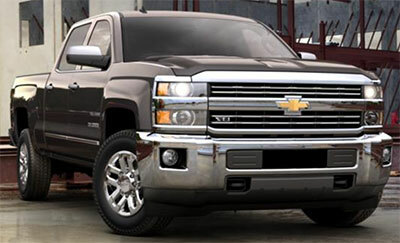 Although both models offer impressive heavy-duty capabilities, the 2015 Chevrolet Silverado 2500HD takes the lead. Its many configurations means that any shopper can drive away with the model that best suits his individual needs. Inside, seating arrangements are roomy and supportive. Occupants can enjoy a wide range of available convenience features. The incredible engine options deliver the power necessary to haul and tow heavy loads.